Lots to share this week including another sign that the first FPB 64 is getting close, the deck tread is being installed. The life raft is in place and the standing rigging for the mast is now installed. A test of your eye for detail (there’s an important symbol). Notice the red on the electrical panels in the background? That’s the AC and DC meters illuminated, indicating the electrical systems are being tested. 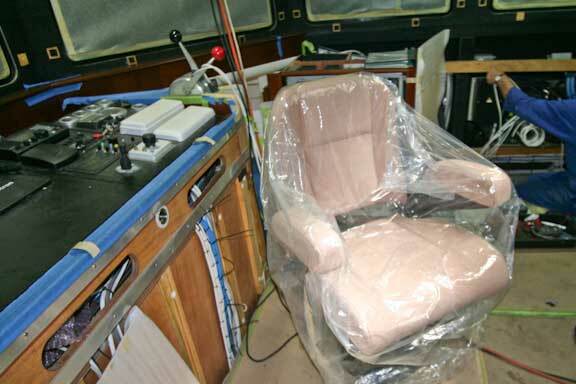 The helm chair is now installed, shown above slid aft and lowered to lounging height. 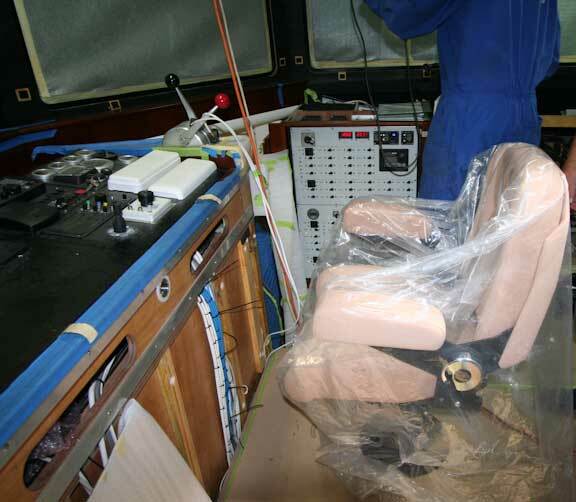 Here the chair has been slid forward six inches (150mm). And in the social grouping position. 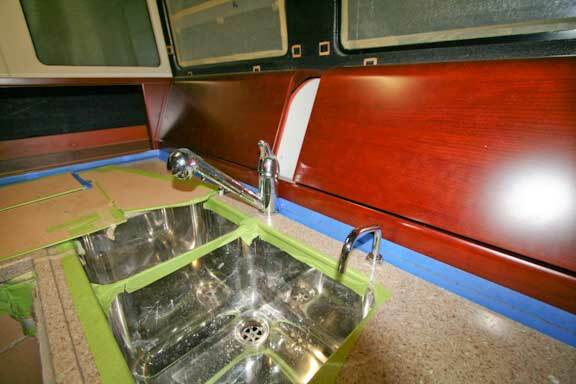 Now to the galley, with the countertop lockers installed. There is a substantial amount of easily used storage space here. 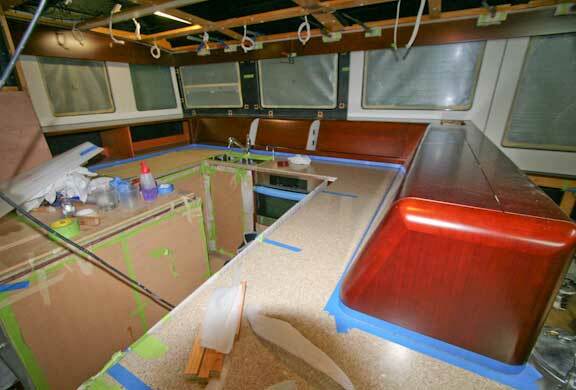 A word on boat building and visual chaos. Because the furniture needs to be protected and there is a large crew at work finishing up, most of the photos we have been showing you the last year are cluttered – not the best presentation. 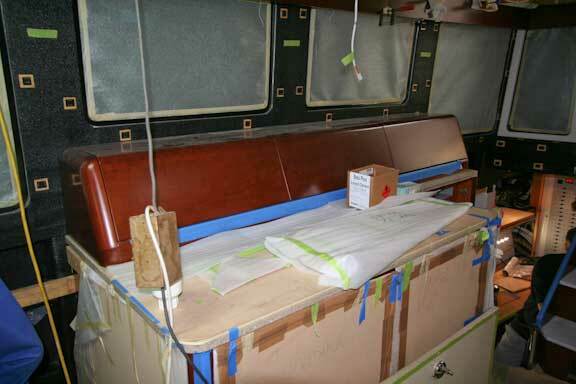 But unwrapping the furniture and moving tools and people slows construction, which we obviously want to avoid. So it is a choice between bringing you along with the build process in detail, or waiting long periods between neatly presented photos. We assume you prefer the former. 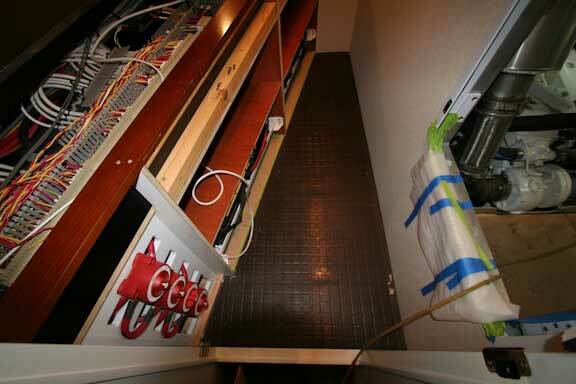 It won’t be long before we are able to show you this first FPB 64 in its final form. Meanwhile, the fresh water plumbing fixtures have been installed (and the pressure system tested). 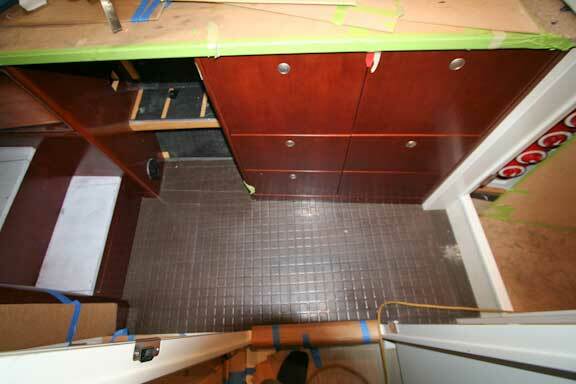 Final galley shot, this of the locker behind the stove (which is under the cardboard). 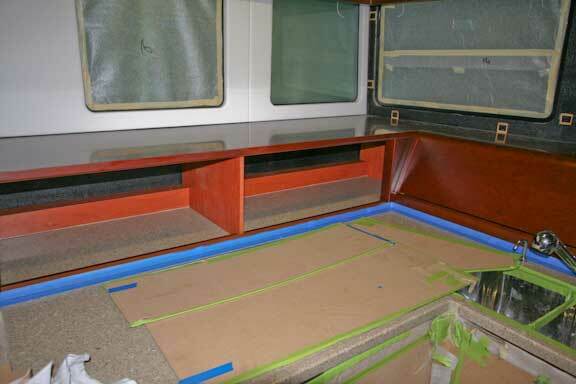 The upper surface of this locker is intended for baskets, cookbooks, and larger appliances. 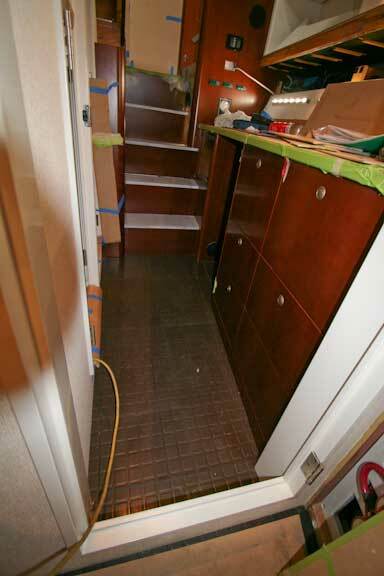 Looking here at the starboard aft side of the great room and the cabinet which houses the washer and drier. Another observation test. Notice anything new here? The Pirelli style flooring is now installed. This is good looking, long wearing, and has a non-skid surface. 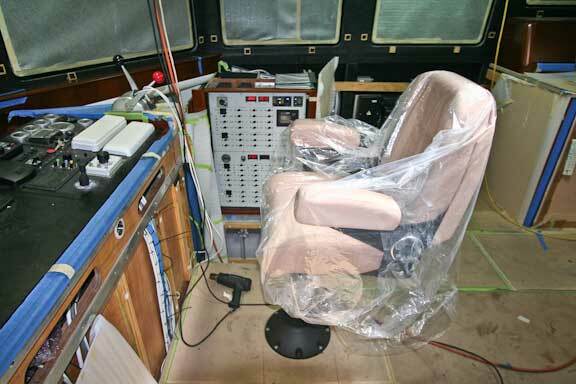 It is being used in working areas such as the galley, office, and aft starboard stateroom adjacent to the engine room. 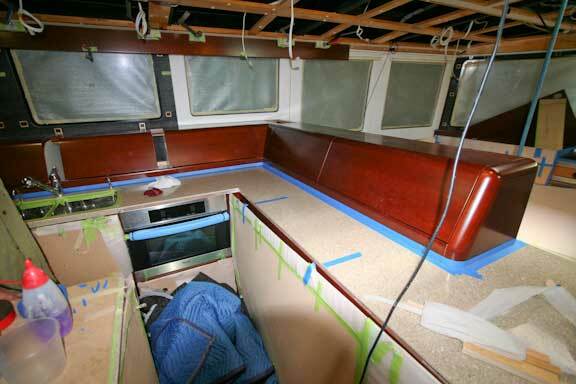 We are looking at the office area sole, with the companionway up to the great room on the left. Lots locker and drawer space for files and office supplies. This entry was posted on Friday, February 19th, 2010 at 11:22 am and is filed under FPB 64 Updates. Both comments and pings are currently closed. I have been following this adventure of the FPB 64 since your earliest updates. As a sailor turned power-cruiser a few years ago, I immediately commenced my fantasy of ordering my own un-sailboat, and still hope to do so. My wife and I cruise the Atlantic Coast, and spend much of our time “at home” on the Chesapeake Bay awaiting retirement. I would love to have you discuss how the 64 would behave…and feel…on the Chesapeake, at different “points of sail,” during one of its classic 30-35 knot blows from the North, with its steep and close 5-6 foot seas. 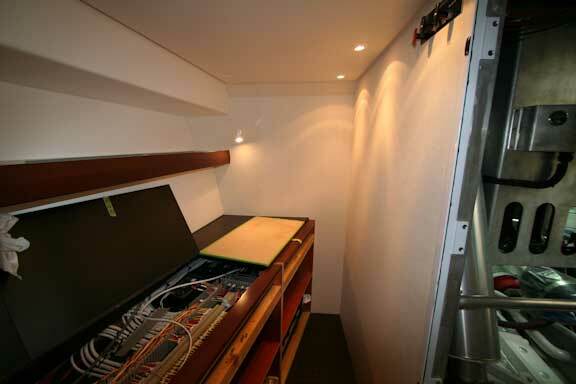 Can’t wait to see the upcoming spreads on Hull #1 when it is launched! Thank you for maintaining this incredible website! We have had the pleasure of sailing down the Bay in a norther, but missed the fun uphill. That said, you are going to have two or more waves within a hull length, so heading uphill will be interesting. The key factor is probably going to be maintaining boat speed. As a guess I’d say 9 to 9.5 knots minimum, and ten might be more comfortable. There will be a little pitching, but the overall trajectory will be pretty flat. If you get a wave crest under the mid-section and a trough at the bow the boat will drop forward, but the impact will be relatively soft given the fine entry and distribution of volume. Bottom line is it would be more pleasant to drop the hook and wait for a change in weather. But if you want to get somewhere the FPB 64 will take you there against the norther at speed. could you please take a few moments to discuss the stabilizer system. 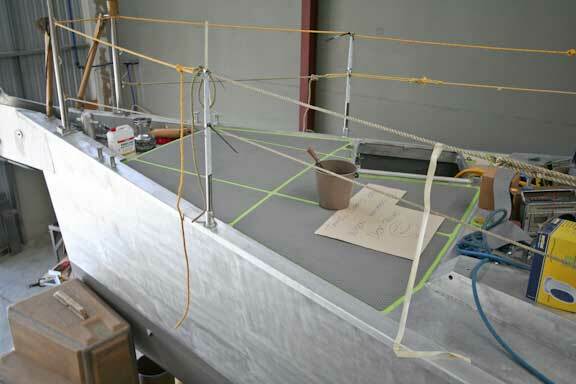 No time right now to answer in detail, but will by early April after sea trials. In the meantime, if you search SetSail for “stabilizers” you will come up with lots of references. 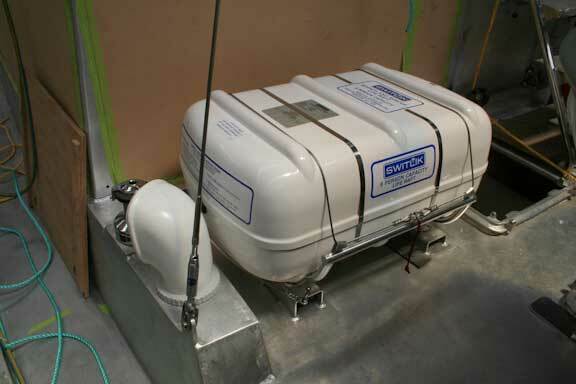 Also the Dashew Offshore site has a lot of info on the stab system of the FPB 83 and 64.